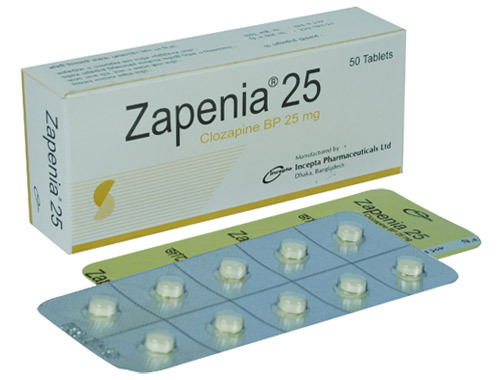 Zapenia 25: Each tablet contains Clozapine BP 25 mg.
Zapenia 100: Each tablet contains Clozapine BP 100 mg.
Clozapine is classified as an \'atypical\' antipsychotic drug because of its profile of binding to dopamine receptors and its effects on various dopamine-mediated behaviors differ from those exhibited by other typical antipsychotic drug products. In particular, although Clozapine does interfere with the binding of dopamine at D1, D2, D3 and D5 receptors, and has a high affinity for the D4 receptor. This evidence, consistent with the view that Clozapine is preferentially more active at limbic than at striatal dopamine receptors. This may explain the relative freedom of Clozapine from extrapyramidal side effects. 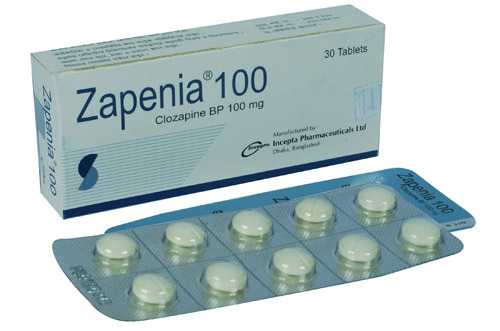 Clozapine also acts as an antagonist at adrenergic, cholinergic, histaminergic and serotonergic receptors. Schizophrenia in patients unresponsive to, or intolerant of, conventional antipsychotic drugs.Psychosis in Parkinson\'s disease. Common side effects are constipation, dizziness or lightheadedness (mild), drowsiness, headache (mild), increased watering of mouth, nausea or vomiting, unusual weight gain. Less common side effects include abdominal discomfort or heartburn, dryness of mouth. Medication should not be stopped abruptly; should be tapered off over 1-2 weeks. If conditions warrant abrupt discontinuation (leukopenia, myocarditis, cardiomyopathy), monitor patient for psychosis and cholinergic rebound (headache, nausea, vomiting, diarrhea). Elderly patients are more susceptible to adverse effects (including agranulocytosis, cardiovascular, anticholinergic, and tardive dyskinesia). Significant risk of agranulocytosis, potentially life-threatening. WBC testing should occur weekly for the first 6 months of therapy; thereafter, if acceptable WBC counts are maintained (WBC 3000/mm3, ANC 1500/mm3) then WBC counts can be monitored every other week. WBCs must be monitored weekly for the first 4 weeks after therapy discontinuation. Use with caution in patients receiving other marrow suppressive agents. Eosinophilia has been reported to occur with Clozapine and may require temporary or permanent interruption of therapy. Cognitive and/or motor impairment (sedation) is common with Clozapine, resulting in impaired performance of tasks requiring alertness (eg, operating machinery or driving). Use with caution in patients at risk of seizures, including those with a history of seizures, head trauma, brain damage, alcoholism, or concurrent therapy with medications which may lower seizure threshold. Has been associated with benign, self-limiting fever (<100.4°F, usually within first 3 weeks). However, Clozapine may also be associated with severe febrile reactions, including neuroleptic malignant syndrome (NMS). Clozapine\'s potential for extrapyramidal symptoms appear to be extremely low. May cause anticholinergic effects; should be used with caution in patients with urinary retention, benign prostatic hyperplasia, narrow-angle glaucoma, xerostomia, visual problems, constipation, or history of bowel obstruction. May cause hyperglycemia; in some cases may be extreme and associated with ketoacidosis, hyperosmolar coma, or death. Use with caution in patients with diabetes or other disorders of glucose regulation; monitor for worsening of glucose control. Use with caution in patients with hepatic disease or impairment; hepatitis has been reported as a consequence of therapy. May cause orthostatic hypotension and tachycardia; should be used with caution in patients at risk of hypotension or in patients where transient hypotensive episodes would be poorly tolerated (cardiovascular disease or cerebrovascular disease). Concurrent use of psychotropics and benzodiazepines may increase the risk of severe cardiopulmonary reactions. Myocarditis, pericarditis, pericardial effusion, cardiomyopathy, and CHF have also been associated with clozapine. Fatalities due to myocarditis have been reported; highest risk in the first month of therapy, however, later cases also reported. Myocarditis or cardiomyopathy should be considered in patients who present with signs/symptoms of heart failure (dyspnea, fatigue, orthopnea, paroxysmal nocturnal dyspnea, peripheral edema), chest pain, palpitations, new electrocardiographic abnormalities (arrhythmias, ST-T wave abnormalities), or unexplained fever. Patients with tachycardia during the first month of therapy should be closely monitored for other signs of myocarditis. Discontinue clozapine if myocarditis is suspected; do not rechallenge in patients with clozapine-related myocarditis. The reported rate of cardiomyopathy in clozapine-treated patients is similar to that in the general population. The majority of patients were over 50 years of age and were taking clozapine for >6 months. Clozapine should be discontinued in patients with confirmed cardiomyopathy unless benefit clearly outweighs risk. Rare cases of thromboembolism, including pulmonary embolism and stroke resulting in fatalities, have been associated with clozapine. There are no adequate studies of Clozapine in pregnant women. Studies in animals suggest no important effects on the fetus. Clozapine can be used in pregnancy if the physician feels that it is necessary. Animal studies suggest that Clozapine is secreted in breast milk. Therefore, women taking Clozapine should not nurse their infants.